While aptamers and antibodies are used in many of the same applications because of their selective binding capabilities, aptamers and antibodies are structurally very different. Ideal buffer formulations, assay conditions, and optimal reagent concentrations can vary significantly between aptamer-based and traditional antibody-based assays. 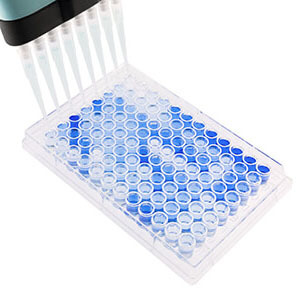 Base Pair offers aptamer-based assay development services for a wide range of applications, including lateral flow assays (LFA), ELISA-like assays (ELASA), dot blots, western blots, and many others. Base Pair also offers advanced aptamer selection, characterization, and optimization techniques to improve real-world, application-specific performance. 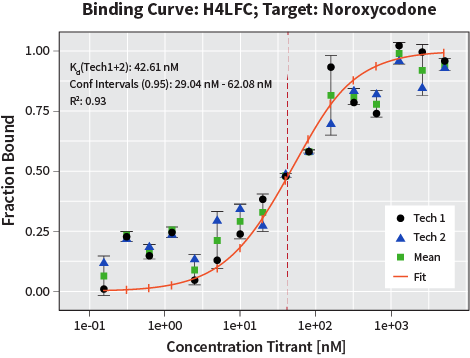 MST data for a Base Pair aptamer to noroxycodone. kD was 42.6 nM. Base Pair employs a number of techniques for aptamer characterization. Aptamer Affinity for the desired target is often a useful determination. Due to the small size of aptamers, MST, or microscale thermophoresis, is frequently employed for affinity analysis. While the dissociation constant for an aptamer does not always correlate to functional performance, it can be helpful when evaluating and comparing aptamers. Functional Testing is most important in evaluating aptamer performance and the effectiveness of aptamer modifications. Base Pair can assist in evaluating aptamers for ELASA (ELISA-like assays), pull-down assays, LFAs (lateral flow assays), and other applications. Perhaps the most important test is actual aptamer performance in a desired application. Base Pair has evaluated aptamers for a wide range of applications. Our scientists are available to assist with method-related aptamer selection, identification of aptamer pairs, aptamer titration, and protocol optimization. Ideal working concentrations and buffer formulations can vary significantly from antibodies to aptamers. Base Pair scientists can apply experience from a large number of aptamer projects to decrease overall assay or method development time. Contact us today to learn more about aptamer optimization and Base Pair assay development services.